On Tuesday 15th March the campaign team were at Anfield to deliver an educational event to over 140 young people. 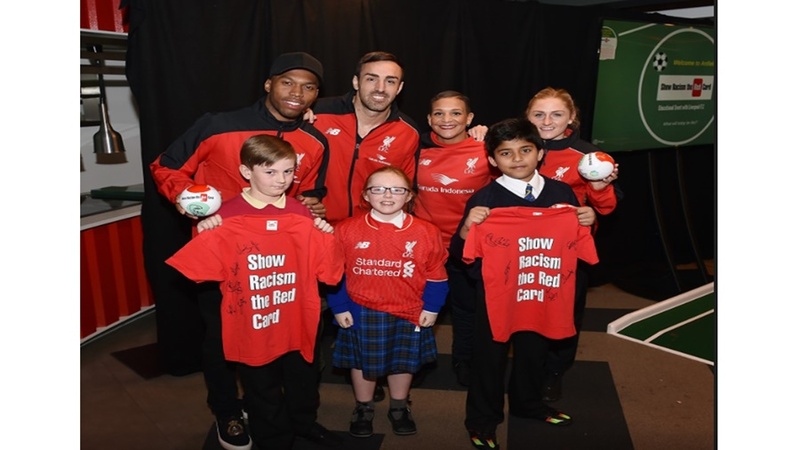 On Tuesday 15th March Show Racism the Red Card (SRtRC) held an educational event in partnership with Liverpool FC, the event took place at Anfield. Over 140 young people from local primary schools attended the event which saw the Year 5/6’s take part in a SRtRC workshop, view a screening of the SRtRC educational film and take part in a Q&A session with a panel of special guests. Young people from Liverpool City schools and Sefton Borough Schools arrived at Anfield in the afternoon and after a quick introduction, the young people went straight into a workshop conducted by Education Worker, Richard Offiong. The workshop allowed the young people to explore stereotypes and discuss the dangers of stereotyping. The pupils further developed their understanding of racism by watching the 22-minute Show Racism the Red Card educational film, featuring top footballers from around the world. The film provides an excellent introduction to the subject of racism. The first individual to be introduced to the panel was John Au, John works for the Anthony Walker foundation who deliver some fantastic work throughout Liverpool. Also joining the panel was Sandra Tai, representing Liverpool City Council. SRtRC Education Worker and former Newcastle United player, Richard Offiong, sat on the panel. Adding to the panel was Show Racism the Red Card patron and Liverpool F.C’s first black player, Howard Gayle. Shanice Van De Sanden and Laura Coombs who have both recently joined Liverpool Ladies FC took the time out of their day to attend the Q&A session. Former Newcastle United player and current Liverpool FC player, José Enrique, joined the panel for the afternoon. And finally, to round off a fantastic panel of special guests was current England international and Liverpool FC striker, Daniel Sturridge. If my friends were racially abused who could I speak to? What would the world be like if racism wasn’t about? What type of racism is the worst? The panel recalled their experiences of racism both in society and on the pitch, Daniel Sturridge shared his experiences of racism and offered some fantastic advice to the room full of young people. ....I don't want anyone in this room to ever say anything racist because those words are very damaging. Everyone deserves to be treated the same way” Sturridge added. ......Go away and tell your friends and your families what you've learned and that you want to help the world be a better place. Young people should be proud of who they are" was Daniel's final advice to the young people present. A Liverpool shirt signed by the first team squad was generously donated by the club as a prize to the individual who asked the best question on the day. Lucy from Star of the Sea Primary won the prize for asking ‘What can we do as a family to stop racism happening?’. Show Racism the Red Card would like to say a massive thank you to everyone at Liverpool F.C for their ongoing support of the campaign, and a special thank you to Alison Boyle, Craig Evans, Jennifer Birtles, Julie Harris and Michelle Kirk for all their help in organising the event. A huge thank you to Liverpool City Council and Sefton CVS, without their support SRtRC would not be able to run the educational events in the area. The power of role models should never be under estimated, therefore, thank you to John Au for the advice he gave to the young people and thank you to Sandra Tai for sitting on the panel and sharing her experiences of racism, likewise, a big thank you to Richard Offiong and Howard Gayle for answering the questions in such detail. A massive thank you to the four representatives from Liverpool FC, Shanice Van de Sanden, Laura Coombs, José Enrique and Daniel Sturridge who took the time out of their day to sit on the panel and speak to the young people about racism. And finally, a massive thank you to all the young people for their honest engagement from start to finish.